If you recently gave birth, you may be anxious to lose some post-pregnancy pounds, have more energy, and beat the baby blues. One way to tackle all three is to choose wisely when it comes to nutrition. If you’re a breastfeeding mom, nutrition is important for other reasons, too. Any eating plan that highly restricts calories or cuts out entire food groups may help you shed pounds quickly, but they have downsides, especially when you’ve recently given birth. These diets aren’t nutritionally well-rounded, and nutrients help your body heal while you recover from birth. They’re also hard to sustain, so you may regain the weight as quickly as you lost it. Where energy and mood are concerned, extreme diets can take a toll. If you’re not eating enough or your diet isn’t well-rounded, you may feel tired, moody, or develop symptoms of a nutritional deficiency. Also keep in mind that most experts say you should recover from giving birth for at least 6 weeks before starting any type of weight-loss plan (many recommend longer for breastfeeding moms). 6 weeks coincides with your postpartum checkup, so ask your obstetrician for the thumbs-up to start. Protein—fish, lean meat, low fat dairy, beans, nuts and seeds. Complex carbohydrates—fruits, vegetables, whole grains and beans. Healthy fats—olive oil, nuts, seeds, avocados and fatty fish like wild salmon. This combo can help you lose weight because the foods take longer to digest than simple carbohydrates (like white flour and refined sugar), so you’ll feel fuller for longer. When you skip this combo and go for, say, a bag of pretzels instead, you’re missing out on nutrients that boost your energy and mood. Simple carbohydrates can also cause your blood sugar to spike and crash, resulting in fatigue and irritability. Be especially wary of snacks like energy bars, which are marketed as a way to rev up but often contain high amounts of sugar. In general, experts recommend hydrating with water and other decaffeinated, nonalcoholic, unsweetened beverages. Sounds boring, we know. But think flavored herbal teas, which you can have iced, or flavored sparkling water. A note on juice. The consensus on juice, even if it’s pure, is mixed. Some experts say that even though the sugar in juice is natural, it’s still too much. Others say added sweetener is the thing to avoid, and pure fruit juice in moderation is great for its nutrient content. 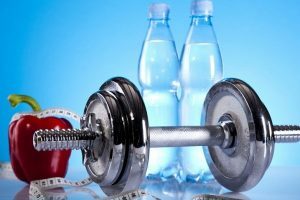 Healthy hydration may help you lose weight, because the more water and other unsweetened beverages you drink, the less you’ll reach for high-calorie drinks like soda or sweetened tea. Research even suggests that drinking water may play a role in weight loss because it can trigger your body to produce more heat, which in turn boosts metabolism. When it comes to energy level and mood, be wary of caffeine and alcohol. It may be tempting to turn to caffeine when you’re tired, but don’t overdo it. Coffee or other caffeinated beverages can give you a quick burst of energy, but when that wears off you may feel sluggish. Too much caffeine can also cause jittery or anxious feelings, and interfere with your sleep. Experts also say to limit postpartum alcohol intake for a few reasons: Too much alcohol can interfere with your ability to care for your baby. It also tends to be high in calories, so it can sabotage your weight loss efforts. Where mood is concerned, remember that even though alcohol can help you feel good in the short term, it can interfere with your sleep and its aftereffects can leave you tired and irritable. It can be tempting to skip a meal in an effort to cut calories (and let’s face it, sometimes finding time to eat when you have a new baby is hard), but experts say that eating meals and snacks at regular intervals is the way to go for sustainable weight loss. Skipping meals can leave you ravenous, which may lead to overeating. Also, not eating regularly can cause your blood sugar to plummet, resulting in a sluggish and snappy mama. At the beginning, the only exercise you get may be walking to and from the changing table. As you recover from giving birth, you can talk to your doctor about getting into an exercise routine. One of the easier ways to move your body during the early days is taking your baby for a stroller walk. Even moderate exercise can help you lose weight, feel energized, and sleep better. As a bonus it’s been shown to increase mood-boosting chemicals in your brain. For more nutritional guidance, take a peek at MyPlate, a tool created by the USDA to help you determine how much of each food group you need based on your age, weight and activity level.